Color – the final frontier, will you boldly go where no woman has gone before? A ten-karat yellow diamond might be attention getting, but a far less expensive option for making a statement is using color in your wardrobe in strategic ways. Consider carefully choosing bright or unexpected color accents to mix with earth tones, pastels, or neutrals. A simple navy tailored dress with a slim patent leather florescent belt in lime green will instantly grab attention. Or try wearing an all white pantsuit and add a tangerine shawl over your shoulders for a color-confident look. Bright colored jeans are part of the new fashion evolution. We used to keep skirts and pants to neutral colors like black, gray, or navy blue and look to bright colors to wear in our tops. Now the trend is to reverse that formula. Wear bright colored bottoms with neutral colored tops for a fun color edge. While this IS fun, I still strongly recommend bringing a spot of that accent color up in a necklace, earring or hair accessory to keep the focus on the face. Find bold prints in a collection of your best personal colors. Think about how a patterned area rug can pull all the colors together that exist in a well-designed living room. Wouldn’t it be great to find a pattern that pulls together your best personal colors? Look for your best shades in graphic prints, floral prints or abstract prints. If you look dynamite in warm tones like olive, tomato red, harvest gold and warm turquoise, see if you can find a big scarf or a printed tunic with those colors in it. If you look best in cool tones like dusty blue, amethyst, soft pink and violet, find a pant, skirt or dress that captures that palette. When you repeat colors that are great on you, you become the spotlight. Look at stripes in a fresh way. Bold stripes in strong color mixes like tangerine and red or bright blue and lime green will be more eye-catching than the traditional white and navy blue stripe or white and taupe stripe. Is this color conversation making you feel like you’re in need of a color update? No problem! I’d be happy to help you. Then we can create some new looks this season that will help you stand out in your “just right” color combinations. Give me a call and we’ll set up an appointment. 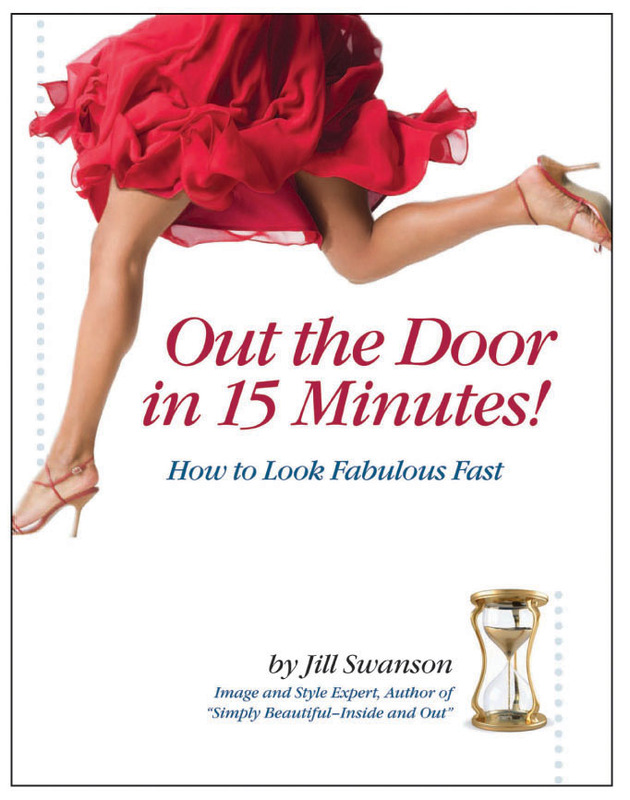 If you don’t have time – or are looking to save time – get my newest book: Out the Door in 15 Minutes. You will find it at my website: www.jillswanson.com or go to Amazon.com.